Zach and I hosted an Ugly (aka really festive) Christmas Sweater party this year where everyone came ready to play some 60-second Minute to Win It games. Upon arrival, everyone was given a score card with the location of the games on it. We had to spread the games all throughout the house when we realized almost 30 people were coming! It was a very casual evening where appetizers and soup were ready for dinner when you wanted to take a break from playing games. For the first portion of the night, we had five individual games set up throughout the house - the three 'living room' games were group games. The Snowball Toss was located in the office. You can also see the 'photo booth' area behind the sign. The goal was to throw the marshmallows, one at a time, through the wreath and land at least 10 in the bucket within 60 seconds. And what happens if you don't have a bucket full of marshmallows to show off? Just look as cute as Caryn by poking your head through the wreath! The Christmas Nutstacker game was loads of fun too! The premise of this game was to load your candy cane with the 8 nuts and then stack them on top of each other - one at a time. In the same room, on the bed, was located 'Do You Hear What I Hear'? In this challenge, the Christmas tradition of shaking presents to figure out what's inside was turned into a 60-second game. Using the lift, rattle, and listen method, you must arrange 7 gift boxes filled with different quantities of jingle bells in ascending order from 5 bells to 35 bells - and then note your guess of the order on your score card. The fourth individual game was called 'Christmas Ball' and was located in the other guest bedroom. Zach moved the furniture around so that we could maximize the space. This game was surprisingly one of the most challenging games of the night. The premise is to fan an ornament using a wrapped gift box into a select area. From what I heard, only a few were able to do it! And as you can see above, here's our pretty wrapped gift box at the end of the night. And the last game... oh boy was this one fun. I choose to place 'Oh Christmas Tree' in the dining room for two reasons - 1. I needed another space and 2. If you failed and the cups came crashing down, everyone would know! How thoughtful of me. It was certainly fun to watch! And here are some pictures of those who took the challenge! p.s. heres' the difference between using a flash and not using a flash. In the picture above, Rachel appears to be calmly placing the cups when in reality this is what she really looked like... Go Rachel, Go! And here's Merlin bringing the cups down for a victory! The skills - not to mention the outfits - of every person that came were so impressive! We have some competitive friends! The individual games were really fun and a great start to our party. It allowed everyone to hang out, mingle, and even show off their competitive side. However, the group games (and by group, I mean, they were played in front of everyone) were a big hit. I had picked out and saved three games I thought would be the funniest to watch. To see the group games, click here! UPDATE: If you're looking for the templates I used for this event, you can access them here. The fonts used are 'Cambria' and 'Blackjack'. You can download 'Blackjack' for free at dafont.com -- this is one of my favorite fonts! awsome a party i would love to be invited to great job!! You would always be welcome! I clicked on the link and the Snowball Toss and the Do You Hear What I Hear games are jumbled together. Help! Hmm... let's see! You're right -- when you click on the link and 'Preview' the document, they do appear to be jumbled. However, it should correct itself once downloaded (or at least on my computer it did)! Feel free to send me an email and I will respond with correct templates. So cute! Where did you get the signs from? I love them!! Thanks! You're so kind! I made them -- if you need the template, let me know and I'm happy to share! I would love to have your templates! Your party looks very fun and extremely put together! Hi i would like it the Template to please and thank you! This is such a great set of activities for a game. I would love the templates. Could I get this template as well? Can I get the template too? Hi! I would love to get the template for this stuff also! How fun!! :) We're having a Christmas Party for our ladies' small group on the 16th and would love to incorporate these games!! My email is dmcovert06@gmail.com. Thank you!! I would also live to have the template for the signs. mfritz80@hotmail.com. Our family secret santa pj exchange is tonight. Would love to play! Thank you and Merry Christmas! I would love the templates as well. krista@churchofemmanuel.com Looks like a fun party! How did you do the scoring portion? How did you do the scoring for these games? How did you ultimately decide the winner? Spectacular! Looks like you have great friends and lots of fun. Merry Christmas! Spectacular! Looks like you have lots of fun with great friends. Merry Christmas! Absolutely happy to send them to you! What's your email address? The fonts I used are 'Cambria' and 'Blackjack'. You can download 'Blackjack' for free at dafont.com at this link: http://www.dafont.com/black-jack.font . It's one of my favorites! Thanks for the great ideas for my family Minute games this year! I am off to get a few sipplies for some of your games. Merry Christmas!! I used two different fonts (just in case it downloads to your computer different than the way it appears in the pictures). I used 'Cambria' and 'Blackjack'. You can download 'Blackjack' for free at dafont.com at this link: http://www.dafont.com/black-jack.font. Enjoy! Love this!!!! Any ideas for the winner's prize? Hmm... I had just picked up prizes that I knew my friends would enjoy. If I recall correctly, one was a $5 or $10 Starbucks gift card (I asked Starbucks for an extra cup and lid, stuck the gift card inside, and tied a bow around it). You could also package up homemade cookies and Christmas goodies -- the guys would love it! Do you need just the images? Happy to share! Can you email me at calliebmiller@gmail.com? THis is such a great idea!!! Thanks for sharing!! Could you send the template for the invitation? Thanks so much, such a fun idea!! Can you share the invitation as well? What did you do with the scorecards? were there prizes? Thank you for sharing! I was looking for something fun for senior citizens. Love these. I am doing a round up of my favorite pins of Christmas and would like to include yours if that is ok. I'd of course link back to you. Happy December. I love this! Any way you could make the description templates PDFs? I have a Mac and when I downloaded your templates from dropbox they were all messed up. Thanks so much! My email is blair.donegan@att.net. Such a fun party idea! I can't wait to host my own! So cute!!! I found you through Pinterest. Could you send me the description templates as PDFs? I tried to download them from Dropbox but I am on a Mac and they messed up. My email is blair.donegan@att.net. Thanks so much! I can't wait to host my own party! Could you send me the invitation template? Thank you for links to the documents you created! Awesome ideas! I would just like to be on the guest list for your next party please. Thank you for sharing your games and templates. It definitely came in handy for our holiday office party. Much appreciated! For some reason these are not downloading correctly. The scroll part at the top is all screwy. ?? You are so creative! I usually do the games at our holiday office party and I will certainly be incorporating some of these for our festivities this year. Thanks! Your coworkers would love it! We had a great time! What a fantastic idea, thanks for sharing. This is fab!! Hi Jennifer! I just emailed you the files. If you have any trouble, let me know! Hi Lindsey! I just emailed the files to you! Let me know if you have any trouble! Callie can you email all of them including the invite to me? Your ideas are wonderful for all ages, I would like to use them next year when I am home with family again. So I have both the fonts installed on my mac but the download still comes through with different fonts. Can I just get the scroll? biscottimommy@yahoo.com Thanks Again! do you have a template for the invitation? Hi Kaylynn! I do have a copy of the invitation. I have added it to Dropbox (https://www.dropbox.com/sh/jw1zqz6sq6rnhqj/m1g-8PaWw7) but if you have any trouble, feel free to email me at CallieBMiller@gmail.com. Oh I'm so glad you're excited! We really had the best time -- let me know how it goes! Thanks for sharing all your resources! Can't wait to try these at our open house! Did you just give out prizes for who won each game? How did you determine the winner? We are hosting a party this weekend and these are perfect! Thanks! Hi Amber! Oh, you'll have so much fun with this party! At the end of the night, the person that had won the most games received the biggest prize. As we were wrapping up, I read out the right order of boxes for 'Do You Hear What I Hear?' and we played the group games. The person who had the most marks in the 'Won' column was our winner for the night! I can't wait for the family party this year. These games will certainly be fun. When I printed from dropbox the pages didn't print correctly. Is there anyway you could email the files to me? damend@mthcs.org Thank you! Hi Debbie! I just emailed you! Hoping that helps! Hi Callie, your ideas are incredible! We're having an xmas party tonight and I just grabbed all of the supplies to play these games. I was hoping to use your templates, but I need to change a few words here and there, like credenza to table.... I can't do that with the pdf and I have no idea how to convert it! Any way you could help? My email address is audreymshaw@live.com Thank you so so much! I hope you had a great party and that the templates worked for you! Oh, my! Not sure I could play the marshmallow one since I have a dog floating around! But we could probably alter it with some other object (I don't guess cotton balls would work?!) Ideas? We always play something like this White Elephant Game, but it's always good to have additional ideas, particularly for those who don't really want to participate. Ha! Your dog would LOVE you -- until he ate all of the marshmallows! What about using styrofoam balls from the craft store or golf balls? Thank you so much for sharing! I'm having my coworkers over later this week for a party and we will definitely try these! Could I please get an email of the templates too? diaryinparadise@gmail.com. Thank you sooo much! Hi Mia! Just emailed you. Love these games!! I was looking for ideas for our Christmas Party this weekend and these are fantastic. 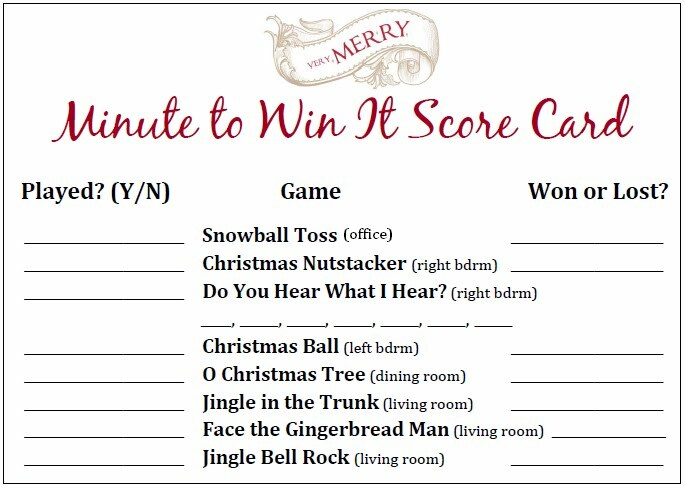 Can you explain how you did the last two games on your scorecard - Face the Gingerbread Man and Jingle Bell Rock? Thank you so much! Hi there! Have you seen 'Part 2' of the Minute to Win It Party? 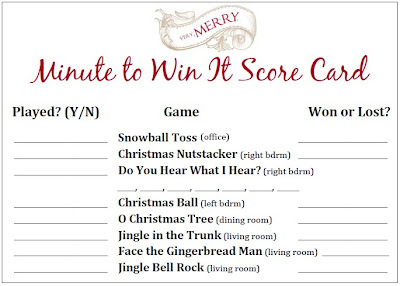 If not, review it here: http://zachandcallie.blogspot.com/2011/12/minute-to-win-it-christmas-party-part-2.html . When scoring the games, for 'Face the Gingerbread Man', if the individual could accomplish wiggling the cookie into their mouth, they got a 'Win' on the scorecard. It was a pass/fail scoring. For 'Jingle Bell Rock', we had two people go at a time, and whoever jiggled out the most bells, 'won'! However, I did ask each participant to note how many bells they jiggled out so that if there was a tie, we could use that number to help determine the overall winner. Hope that helps!! Let me know! These games look awesome! I downloaded the templates and am going to use this for our youth Christmas party this weekend! Thank you for sharing these wonderful ideas! Hi Kim! I just emailed you the templates! Have fun!! Hi Marsha! Just emailed you! Thank you so much for sharing. I am game hostess at a company Christmas party tonight and I'm going to use these games. I really appreciate you downloading your templates and allowing me to use them. Blessings. I hope you have a great time! Enjoy!! Just emailed you! Have fun! HI ! Can I get a template as well? Thanks! Hi Bridgettann! Yes, absolutely! Can you send me an email (CallieBMiller@gmail.com) or share your email address with me? Thanks! Thank you so much for sharing these templates and ideas. I was able to use them for a party last night and you saved me a ton of time, plus we all had a blast! THANK YOU!! Awesome!! So glad you had fun! Thanks for letting me know! Emailing you now! Have fun! Wow, 50 people! What a great hostess you must be! Just emailed you the templates! Can you please send me the templates also? I am having trouble downloading them. The message I am getting says "The required index.xml file is missing", not sure what that means. Emailed you! Let me know if you continue to get the error message. 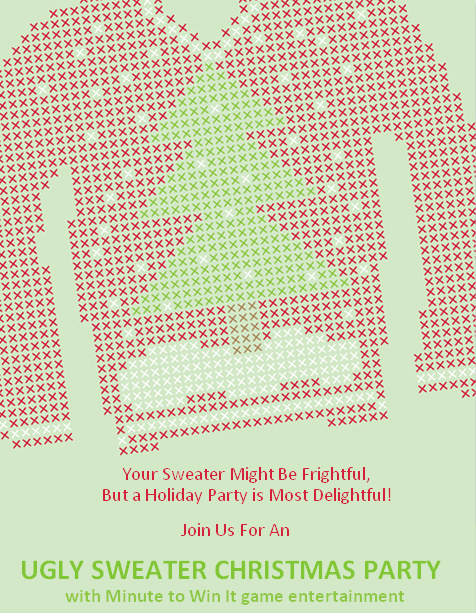 I am having a ugly swearer party tomorrow! Can you please send me an editable version? This looks like tons of fun for my whole family! Absolutely! Just shoot me an email (calliebmiller@gmail.com) or provide your email address here! Emailing you now! Have a great time! Could you please email an editable version to me also (jtronoski@earthlink.net). These are so cute and going to do a lot of them for our class party at school tomorrow! Thank you! On its way to you now! Have fun! I think I fixed the problem with Dropbox! If you need the templates, try this link: https://www.dropbox.com/sh/jw1zqz6sq6rnhqj/AADZ6J5RVCNvi0h2vS2-eQ4ca?dl=0 . If that doesn't work, feel free to email me at CallieBMiller@gmail.com! I appreciate your help so much!! Merry Christmas! Emailed you! Have a great time! I think this is just what im looking for. for the staff party. Just sent you an email! Merry Christmas! I just sent you an email! Hi Amber! Just emailed you. Let me know if it works for you! This is awesome idea! Could you send me the templates when you can arrowman1@centurytel.net please and thank you!!!! Have a great time! Sent you an email moments ago! Can you send me the templates for all of the games? I would be happy to! Send me an email at CallieBMiller@gmail.com or share your email address. Thanks! Hi Callie, what fun! We had a party like this a few years ago, but did not have your wonderful templates. We are wanting to have another party this year for our teenaged daughter's softball team. It would be much nicer if you would share your templates with us. Thank you. Wow! what a wonderul post and amazing Christmas party! Would you mind sending me an editable version too? Hi Teresa! I would be happy to share the templates with you. Would you shoot me an email at calliebmiller@gmail.com? Could you please email me the templates. Love your games and the directions. Thank you for taking the time to do this. My email address is devlyn3@ca.rr.com. I really appreciate it and Merry Christmas to you and yours. Headed your way! Merry Christmas! Could you kindly send me the templates for the games? Thanks! Hi Kristy! Happy to send them to you! Just shoot me an email at calliebmiller@gmail.com or reply with your email address. Thanks! I would be happy to send them to you! Would you mind emailing me at calliebmiller@gmail.com or providing me your email address? I would love to have your templates. Just sent them your way! Merry Christmas! I love your holiday enthusiasm. I am planning a Christmas party for my work staff and would love a copy of your templates for this. If you could, would you mind sending a copy to jennoates@yahoo.com? Would love to have a copy of the pdf templates are you still sharing? I would love your templates if you still have them! thank you! Of course! Just emailed you both. Have fun! What did you use to hang your wreath with? This looks like a great game for the grandkids! Hi Jean! We used fishing line looped around the wreath and used a tack to attach it above the door frame. Have fun! Our Christmas Party this year was an Ugly Christmas Sweater party with Minute to Win It games. The post detailing the first portion of the night and the individual games can be found here. Although the individual games were really fun and a great way to start the party, I just couldn't wait for everyone to come together to play our last three games. I would laugh just thinking about the games. The first game was 'Face the Gingerbread Man' and the goal of the game was to move the cookie that had been placed on your forehead into your mouth using only the muscles of your face. And some of the happy winners! There is always, always, always something to be thankful for - today and everyday, you're it!